When you tell Papyrus to “Show Direct Speech Only”, your dialog pops out, allowing you to concentrate on how your spoken parts sound as you work through and edit your text. By clicking on “Show Direct Speech Only” (Menu: View) or with the icon in the toolbar, you can assign all text that is not dialog a very light color (change the color under “Preferences” → “Display” → “Appearance”). Papyrus searches for your quotation marks. If a piece of dialog is not showing up properly, you should check to make sure the quotation marks around it have been used correctly (and perhaps the quotation marks for your text in general). 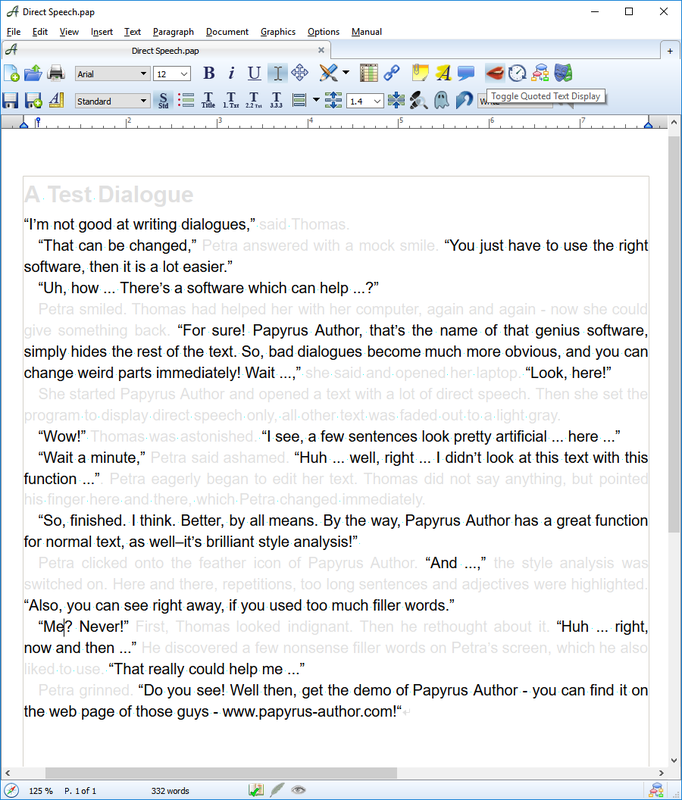 An example document for you to experiment with is the “Dialog” text in your example document folder in your Papyrus folder. Remember that you can choose which type of quotation marks you would like to use in your text under “Preferences” → “Keyboard and Mouse.” The quotation marks you have already used in your document can be changed in the “Edit” menu under “Special” settings.